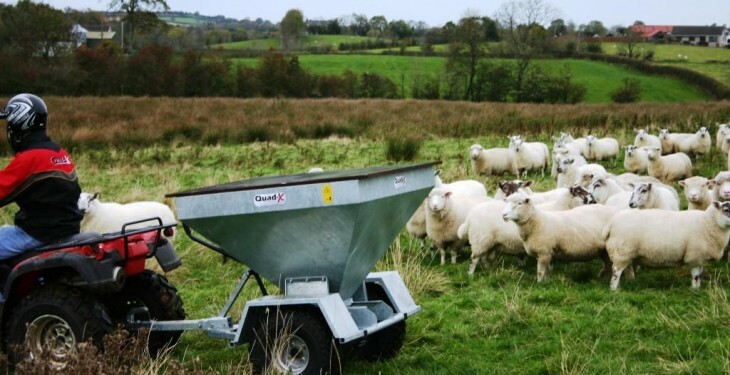 Quad-X claims it has an innovative offer for sheep farmers to help save time and hassle in feeding your sheep meal and silage outdoors. Quad-X Stock has manufactured a feeder which it says has been designed by farmers for farmers to take the hassle out of feeding. It says their machine means no more bags and no need for troughs. The Quad-X Stock Feeder has a 350kg capacity allowing you to feed your entire stock in just one fill, saving you valuable time. 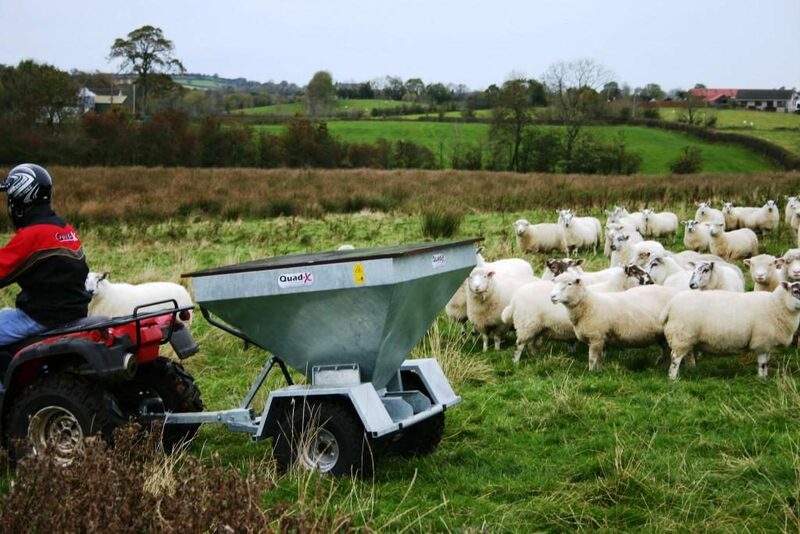 The ground driven stock feeder distributes feed in piles 6ft apart and allows you adjust the feed ratio from ½ kg to 2kg. With the feed being evenly distributed in spaced out piles, stock will stand head to head and so there is less trampling and fouling in the feed meaning less meal is wasted, saving valuable money. According to Quad-X, the Stock Feeder can be easily attached to any ATV, UTV, jeep or towing vehicle making it ideal for any farmer. It says when it is attached to any ATV it can be operated and the flow rate controlled from the comfort of your seat. The Quad-X Stock Feeder comes with flotation tyres as standard making it ideal for use on most ground conditions even when the hopper is full. Quad-X says the hopper is galvanised to ensure durability and long life. The company says it is suitable for use in wet weather, equipped with a wooden cover or an optional tarpaulin cover to ensure your feed remains dry while out in the fields. 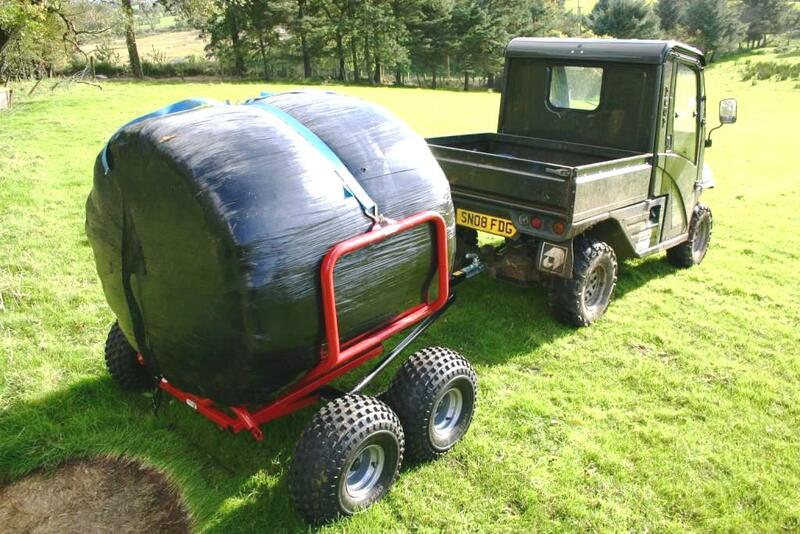 Quad-X has also manufactured a bale transporter. it says this special trailer can be towed with an ATV, utility vehicle, car or 4×4. Quad-X claims the bale transporter is ideal for bringing in bales from the field and moving them around even in wet conditions. According to Quad-X, the bale transporter has been cleverly designed ensuring it is well balanced in order to reduce the weight on the drawbar of the towing vehicle. You can even re-position the transporter by hand when it is loaded with a hay bale. The trailer has clamping arms which are designed to minimise wrap damage during loading and transportation. If you would like any more information on the Quad-X Stock Feeder, Bale Transporter visit www.quad-x.com or call us on 02825 872 800.